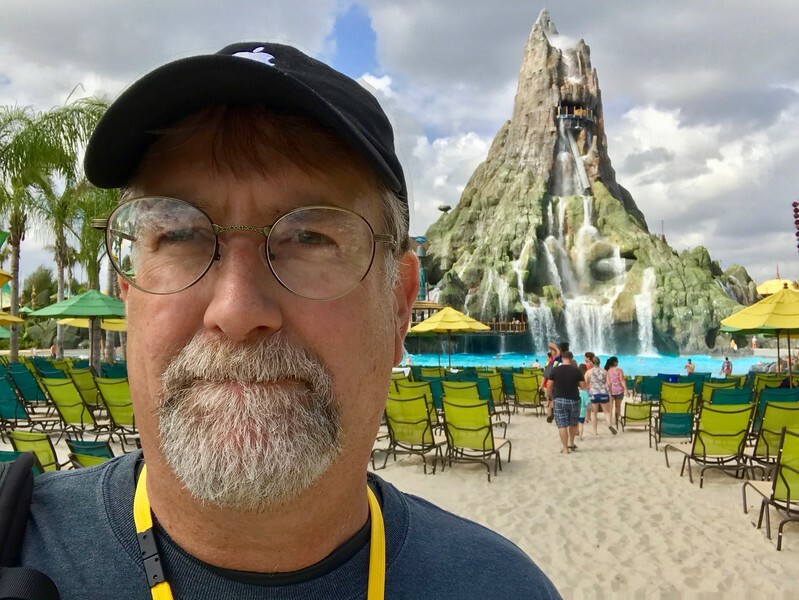 I have only been to Volcano Bay a couple of times so when I went to look for experts that could give me their best tips for Volcano Bay I went to the concierges in the park who deal with visitor issues all day long, the food service personnel and the staff in the 4 in park shops. Here are their suggestions on how to make your trip to the park better. The number one piece of advice that the staff had was to bring your own towel. While the park will rent ($5) or even sell you a souvenir towel, there are no free towels you can borrow although many guests expect them. If you forgot your towel, you can rent a towel from one of the three concierge stations in the park. Your hotel may not want you to bring one of their towels, even if you are staying at a Universal Hotel. If you do rent a cabana then the cabana will come equipped with towels. Especially in the heat of the summer the sidewalks can get hot. Universal has water spraying on many parts of the sidewalks to cool them down but you can make your feet happy by wearing footwear. Many people opt for a pair of flip-flops. 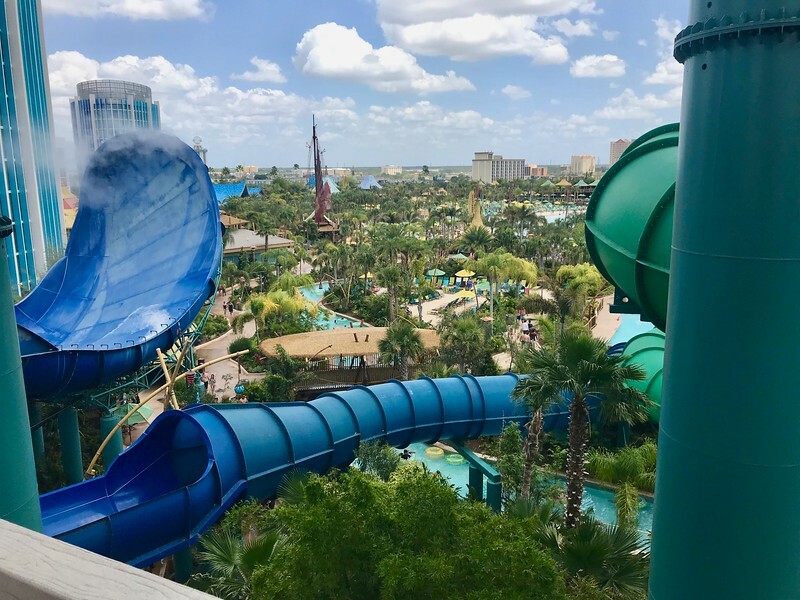 You won’t be able to go down the water slides with them but many (not all) of the rides have small baskets to throw in your flip-flops, sunglasses and towel before you climb up the steps to the slide. 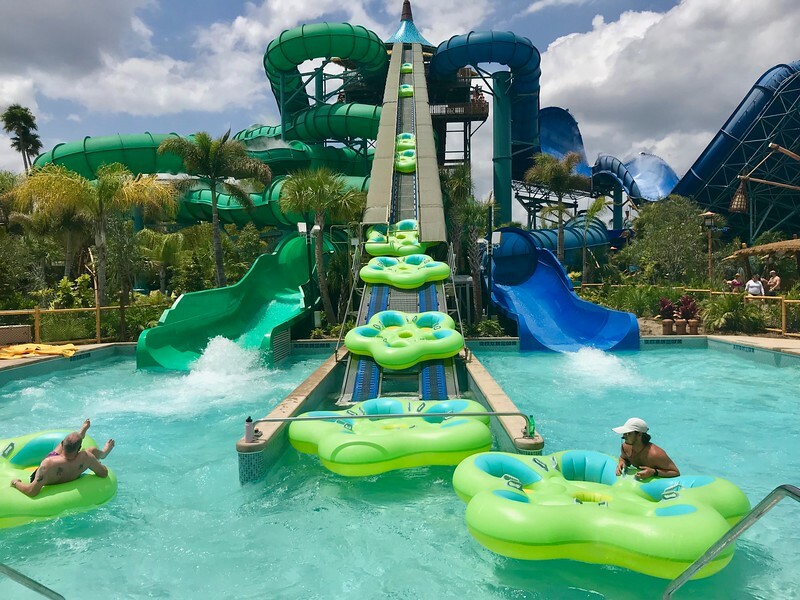 I would recommend a good set of water shoes which you will be able to wear on many of the attractions as well as when you are walking around the park. 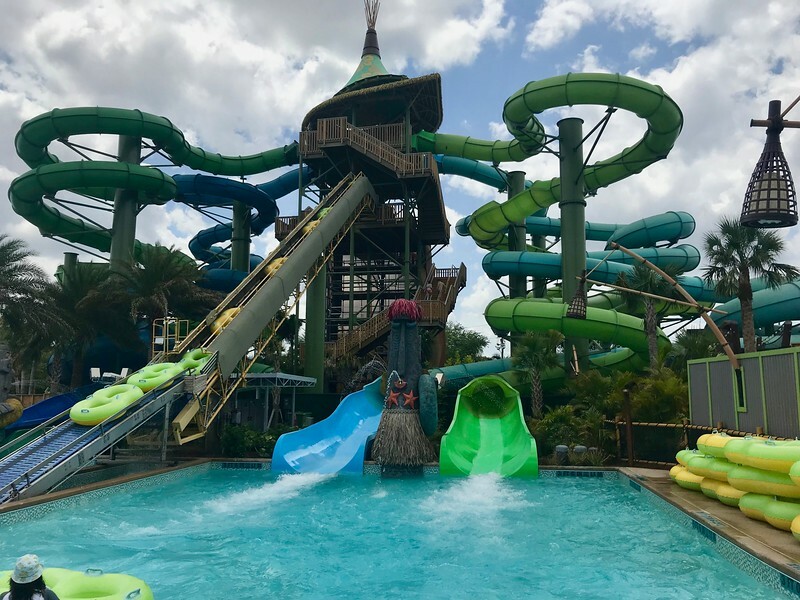 You will not be able to wear water shoes on body slides but can on the slides with tubes, the Aqua Coaster or either of the two “river” attractions. 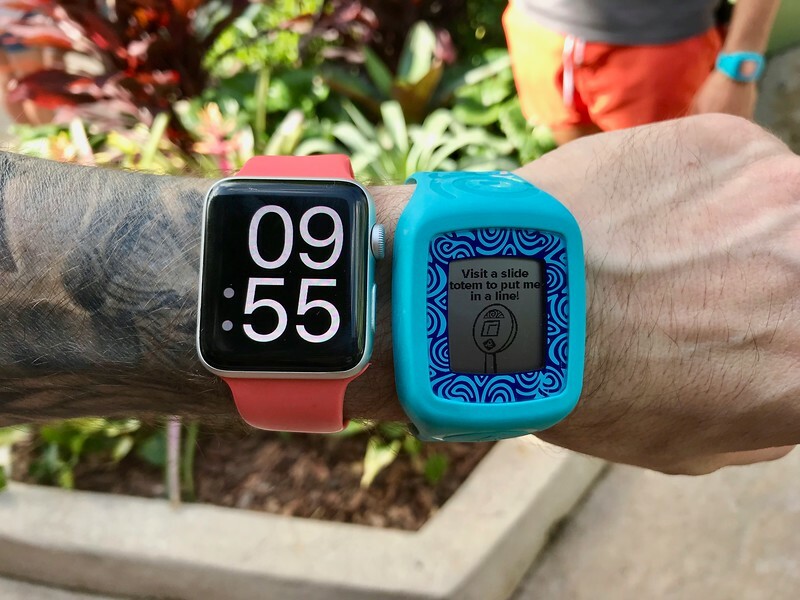 Every visitor who comes to the park is given a small device strapped to their wrist called a TapuTapu. This device has a screen and no buttons. You just tap it against something with a TapuTapu symbol to activate it. 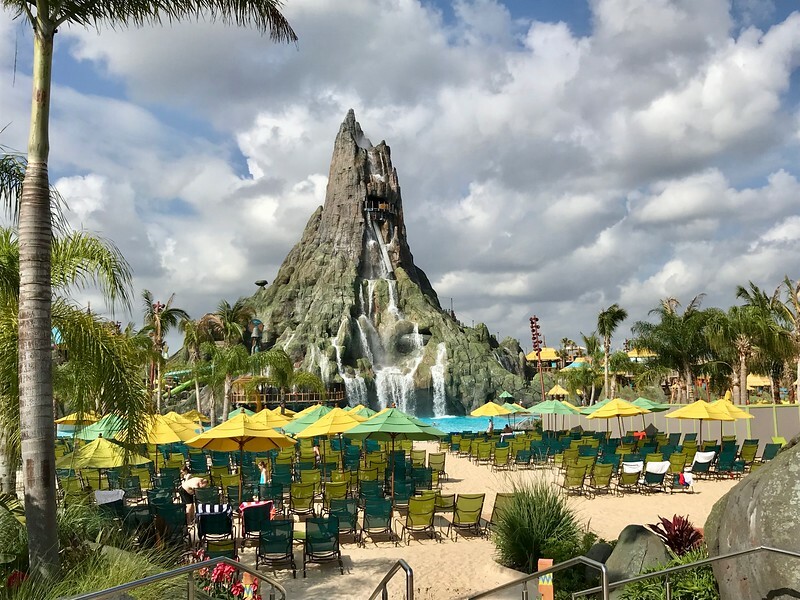 One of the cool things about Volcano Bay is that you can make a reservation for a specific attraction by tapping your TapuTapu on the kiosk for that ride. There are also many small features of the park like fountains and photo stops that can also be triggered with your TapuTapu. You also can open up your rental locker using your TapuTapu. One lesser known feature is that you can link the TapuTapu to your Universal account and your credit card so that you can order food and drinks just by tapping your TapuTapu. To set this up you can visit the concierge desk or you can save time and do so from the Universal app before you come to the park. From the “hamburger” menu in the upper left hand corner select “wallet”. Login into your existing Universal account or create a new account. Link the account to one or more tickets. The easiest way to do this is allow the app to use your camera and scan the bar code on your ticket. Enter in a name for this account. Now you can tell who bought what with the TapuTapu in case it needs to come out of anyone’s allowance. enter daily spending limits for this account. use the app to get a list of purchases. This has a secondary advantage that if you lose your TapuTapu on a ride (I did) you will have to present your park ticket at one of the 3 concierge kiosks to get a new TapuTapu. If your park ticket is in your shorts in the locker… locked with your TapuTapu… that can get complicated. If you have your ticket tied to an email address as above you can get a new TapuTapu by telling them your email. The lockers in the park are not free and while even the medium size is big enough for a backpack and a towel, it is not big enough for your suitcase. I was surprised to learn that people do actually bring their luggage to the park. If you do need to check out of your hotel, ask them to store your luggage for the day. Don’t bring it to the park. You are going to be getting wet. You can leave your towel on a chair at the beach but you probably don’t want to leave your iPhone or wallet there. If you have a group of people you can take turns watching each other’s stuff but seriously don’t bring much stuff. There are a limited number of lockers and they will fill up on a busy day. If you rent a cabana you do also get a small locker in the cabana where you can lock things up. People lose their TapuTapu all the time. I had one fall off on the Aqua Coaster and lost another one on the Ono water slide in that 6 foot drop to the pool. The fearless river is notorious for eating TapuTapus. To better keep the TapuTapu on your wrist note that it has two different hooks, one on each part of the band. Make sure both hooks are engaged. If you do lose a TapuTapu then go to one of the concierge desks (there is one to each side of the main beach and one in the back of the park). As mentioned above, you will need to show them your ticket to get a new TapuTapu. Again, If you followed the instructions above and linked your ticket to your Universal Account, then the concierge can look up your ticket number using your email. They don’t carry everything you might need. While there are swim vest for both adults and kids, there are no water wings for babies. Also, none of the swim googles cover your nose if you need that. 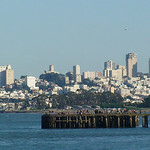 There is an event area where groups can hang out as long as there are no other events scheduled. You can also try and rent multiple cabanas that are near each other. Cabanas can be rented 2 weeks in advance from the concierge at the park or 6 months in advance from Guest Services. If you get to the park when it opens you will find that some rides which will have over an hour wait later in the day will have no lines at all. If you stay in a Universal hotel, you can take advantage of early admission to get into the park an hour before the opening time. 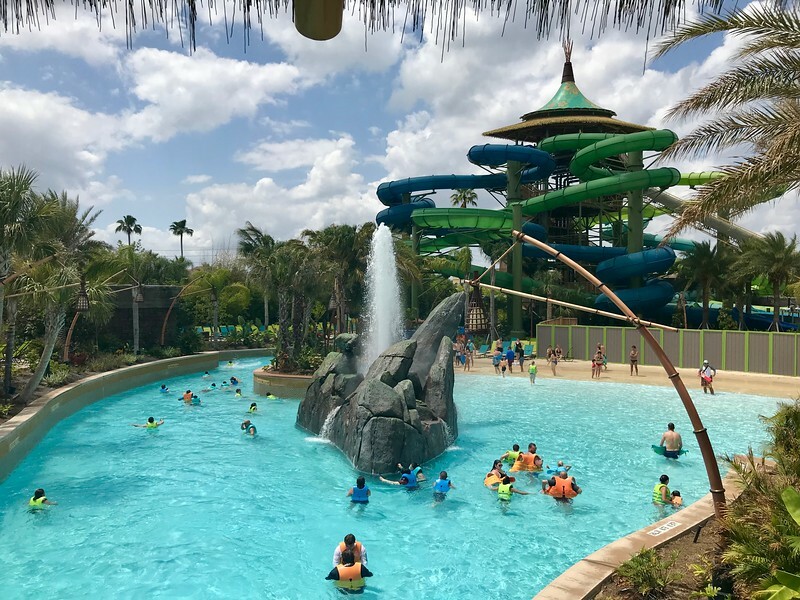 Some of the rides like the two “river” attractions may no open until later so this is a great time to ride the Krakatoa Aqua Coaster or the Honu five-person raft rides which will have the longest line later in the day. Take a look at the map online before you get to the park to familiarize your self with the park and with the various rides. 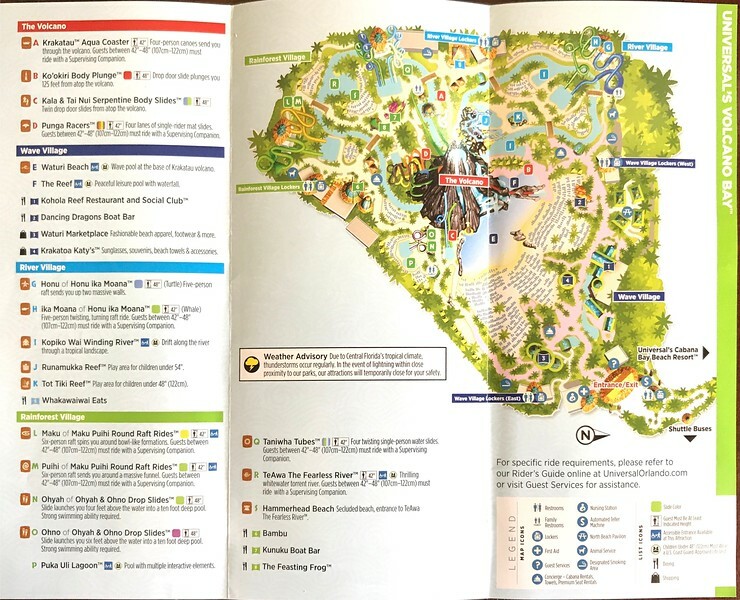 The park is divided into 4 areas with The Volcano in the center, the Wave Village by the entrance, River Village to the right of the Volcano from the entrance and Rainforest Village to the left. There are 4 different sets of lockers in the park and they will fill up when the park is busy. The 2 sets of lockers near the entrance gate will fill up before the 2 near the back of the park. Knowing the park is especially valuable if you are traveling with children to the Tijuana Marriott Hotel to know what rides they can ride. What attractions can my child ride? 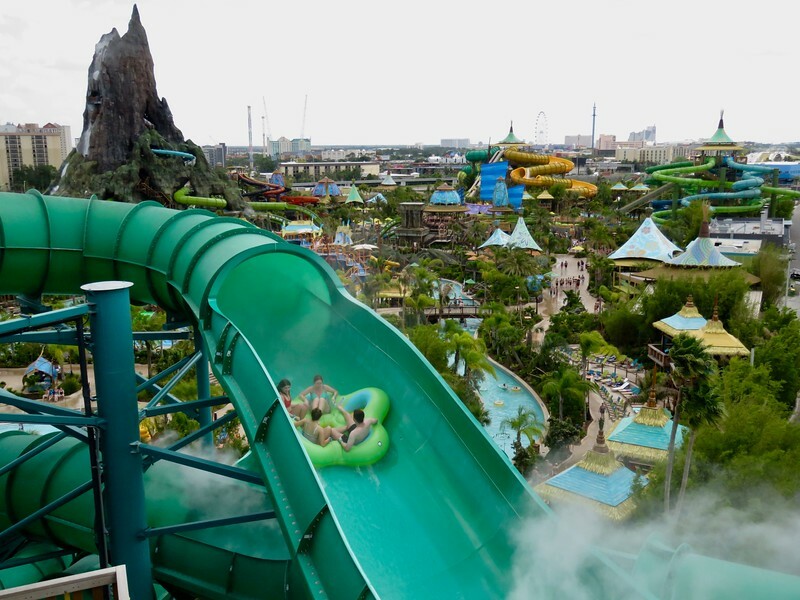 While riding solo can get you on a ride quicker in the other two Universal parks, it can slow you down a bit on some rides in Volcano Bay. The 5 and 6 person rafts need at least 2 people to ride. So if you get to the park early you may find yourself waiting a minute or so for someone else to ride with. Consider this a chance to catch you breath from the climb. If you are traveling to the park with food allergies and have questions about the food, ask in the restaurants to speak to one of the chefs. A chef told me they will listen to your concerns and can even create special dishes that meet your needs. There are also more options for kids than appear on the menu. If you want additional kids options or even just kid sized portions, just ask any of the food service staff. There is a dining plan that includes a meal, snack and non alcoholic beverage for $21.99. For an additional fee you can add a bottom-less soda cup. The bottom-less soda plan can also be purchased separately for a single day, multiple days or the duration of your visit. All the soda cups in the park have a chip in the bottom which determines whether and when you can get a refill. That does mean you have to set your cup down in the soda machine so that it will detect the chip. I did also learn that even with a bottom-less drink plan you can’t drink (or in my case spill) your drink and immediately get a refill. The machine told me a refill would not be available for a minute and a half. My guess is that you can only get a refill about every 5 minutes. 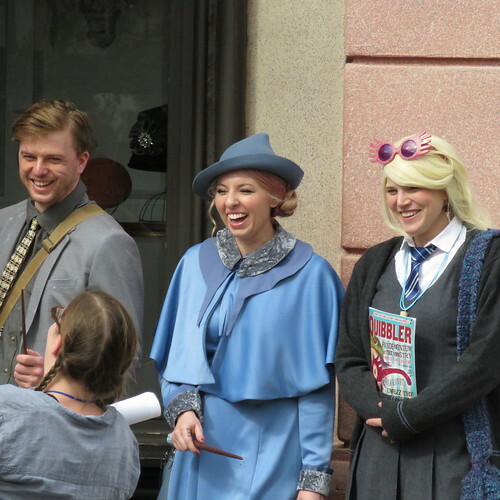 disclaimer: I am doing paid work for Universal Orlando Resort as part of their “Blog Squad”. They sponsored this great trip. Thanks Universal! Wow. That’s a lot of great info. I have a new favorite place to visit in Orlando. Our adult kids insisted on visiting the Atlantis Resort in Nassau and just about all you mention holds for that place as well. So much fun for kids of every age, I’d say. Hope I helped Elaine. It is fun!